¶ There are four styles of lubrication used on Four Stroke Motorcycles. 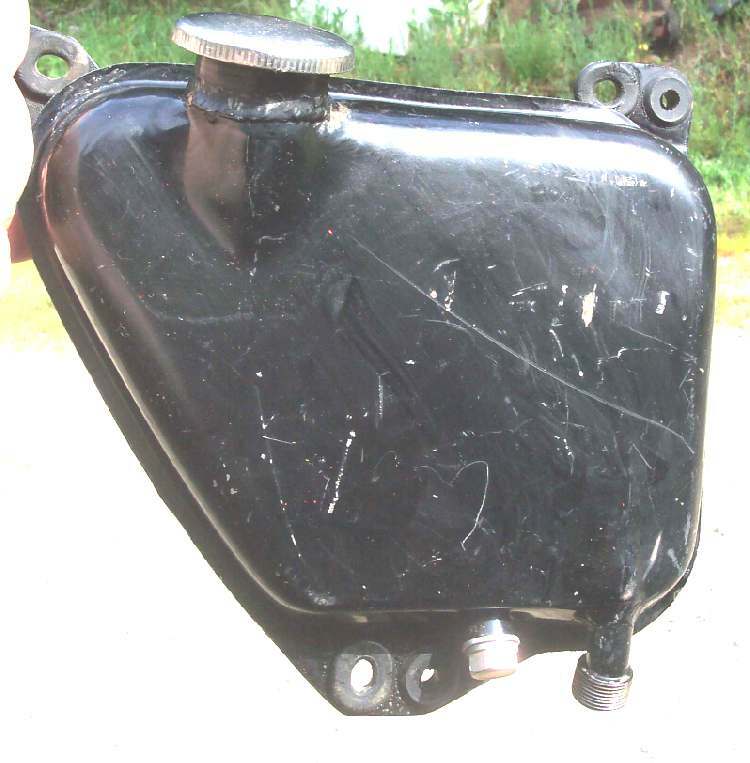 Wet Sump engines use an oil pan (sump) to store the oil at the bottom of the engine and use an oil pump to pump the oil to where it is needed in the engine. 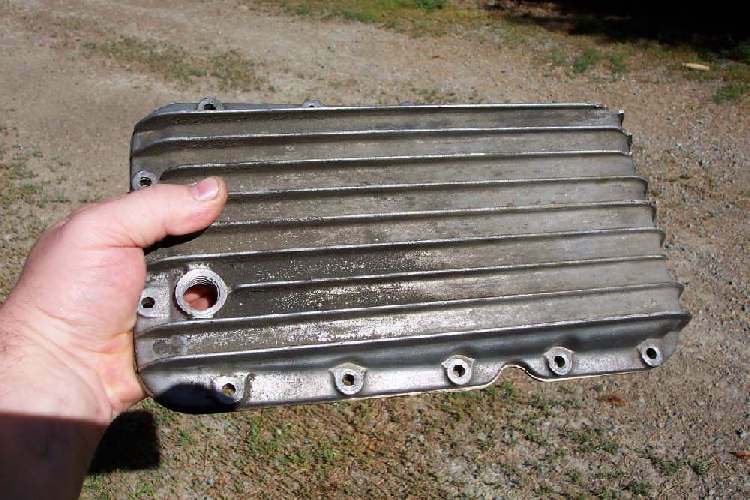 Some engines of this type will have a removable oil pan and some won't. 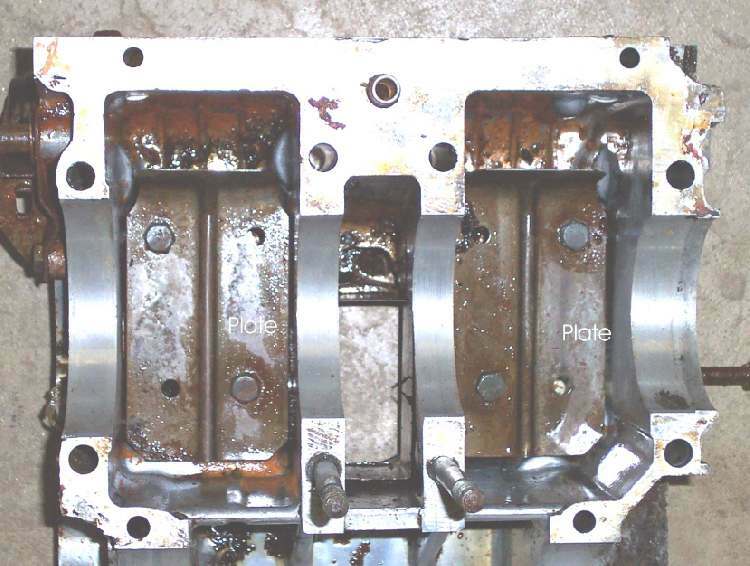 Most Wet Sump engines have a plate under the crankshaft and over the oil. 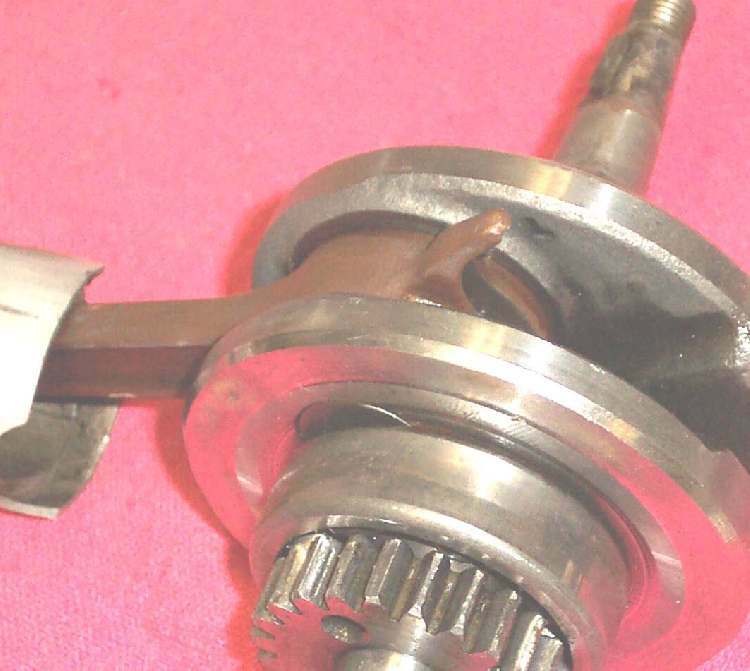 This is to prevent friction losses from the oil splashing on the spinning crankshaft. this seems to be the most popular oiling system. Most Japanese machines are Wet Sump, but not all. Dry Sump engines carry their oil in an oil tank that is separate from the engine. This can be an actual tank or inside of the tubes of the frame. 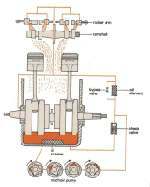 This engine lubrication type uses two oil pumps. One to pump oil to the engine, where it lubes everything and then drops to the bottom of the engine. From there, the second or scavenge pump pumps the oil back to the oil tank. 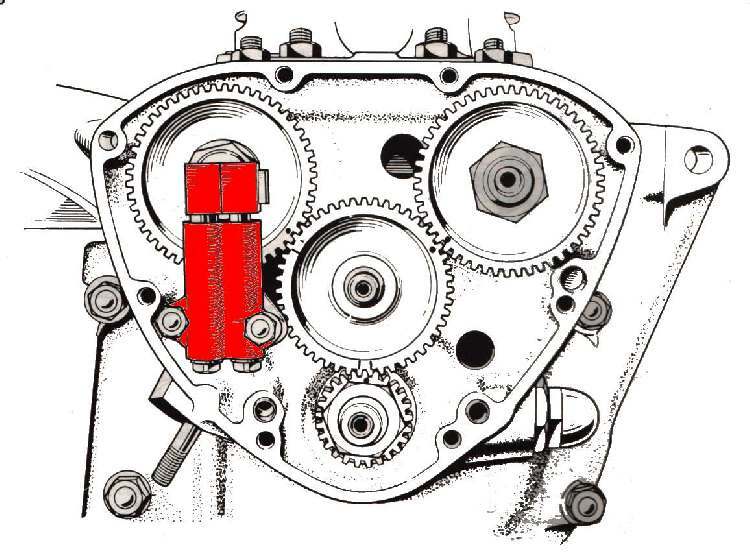 Sometimes the scavenge pump also pumps oil to the transmission, valves and other places in the engine. The scavenge pump is twice as big as the main oil pump. 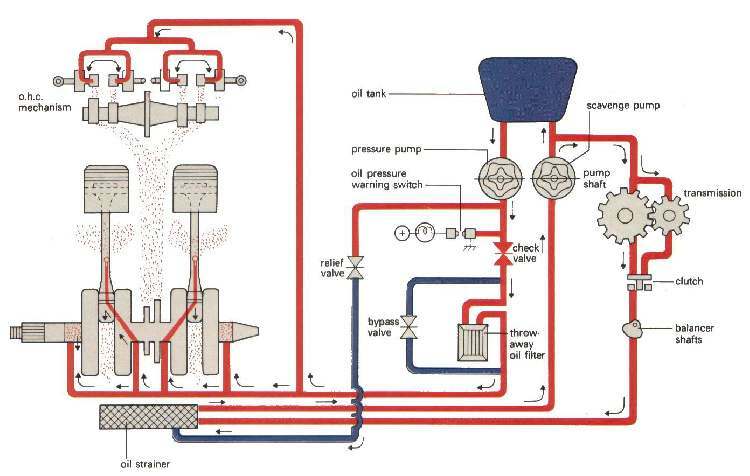 If you look at the oil return pipe, when the engine is running, it will be spurting oil. This is normal. Dry Sump engines tend to back flow oil into the lower part of the engine when they sit for long periods of time. Because of this, you will need to run the engine for about five minutes before checking the oil. If you are not sure whether the engine has any oil or not, add a pint and then start the engine. If the oil level rises you can siphon some out. If not, add some more oil. At worst the oil will overflow, which is better then no oil. 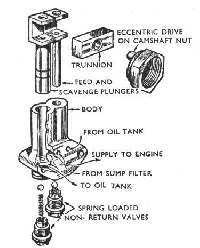 The first Honda 750/4s used dry sump as did Triumph, BSA, Norton, Harley Davidson, Suzuki DR350s and others. Splash Lubrication is pretty primitive. A hook, cast or bolted onto the crankshaft, dips into the oil in the sump and splashes it around the inside of the engine. This system was used on some of the first motorcycles in the early 1900s. It was also used in small Briggs and Stratton engines up until a few years ago. 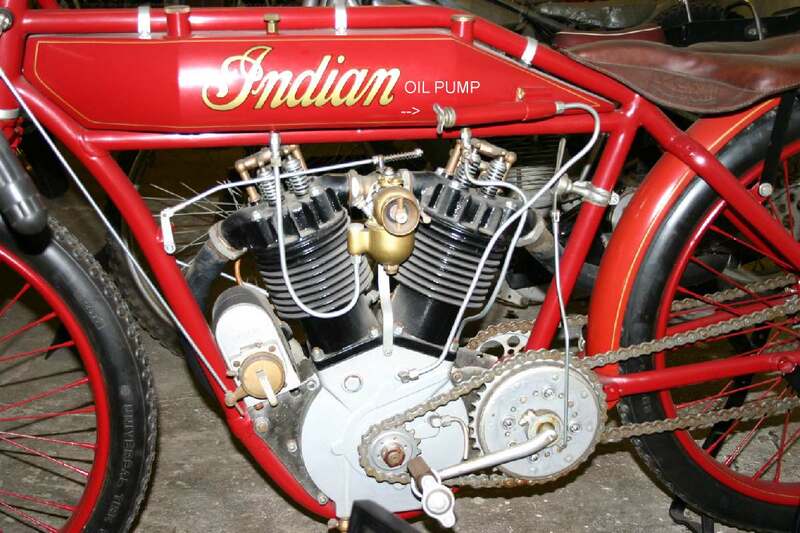 These engines where used on Heald motorcycle and three wheeler kits. For low speed (3600-4000 RPM), side valve engines, this was a very workable system. I've seen these little engines run, quite happily, for 1000 hours and more if you keep the oil level up. These are pretty much fazed out now, but you will still run into one now and then. Lastly we have Total Loss lubrication. 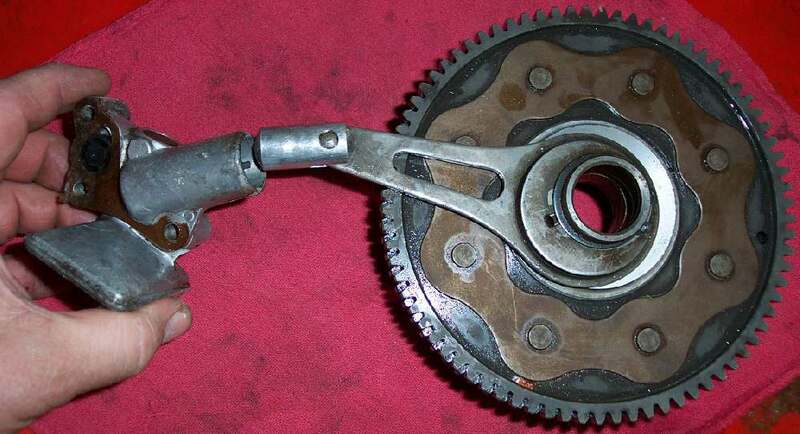 This was used on motorcycles back in the early 1900s. 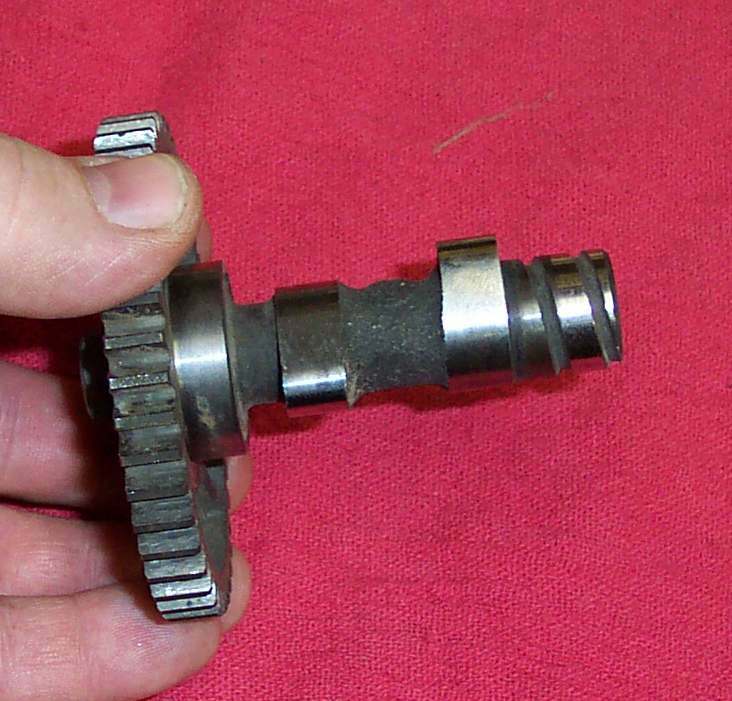 Early motorcycle engines had plain babbet bearings or roller and needle bearings or a combination of both. Oil, oilpumps, babbet and everything else were all kind of new back then and not as good of quality as we have today. Because of this, high output engines used roller and needle bearings. The engines had hand pumps on their oil tanks. When you started the engine you gave 'er a shot of oil. Every so many miles you would give the engine another stroke of the pump. The engine used up the oil and got more clean, fresh oil to the bearings with each stroke of the pump. The engines had sumps and these where filled with oil to start with and splash lubrication took care of the rest of the engine. This gave lots of clean, fresh oil always going through the engine. Sometimes the engines had a Drip feed Lubricator, in addition to the hand pump. One pump of oil every eight to ten miles at 20 MPH was deemed sufficient. At 30 MPH you needed one pump every five or six miles. The Drip Feed should be set at 8 drops per minute, just in case you wanted to know. I don't think you will run into too many of these machines. 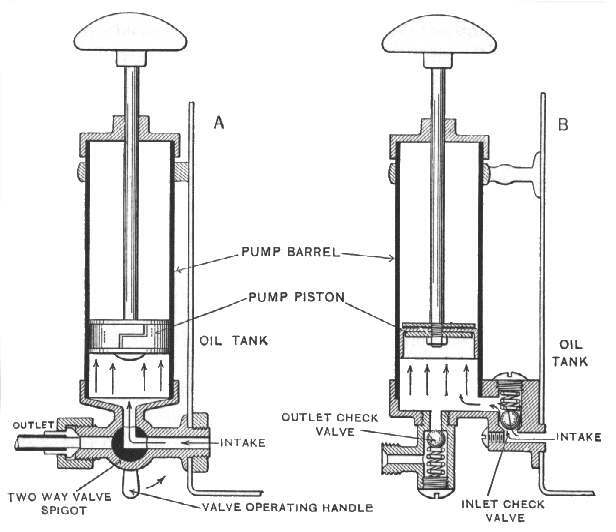 There are four types of oil pumps. At least that's all I've found so far ! 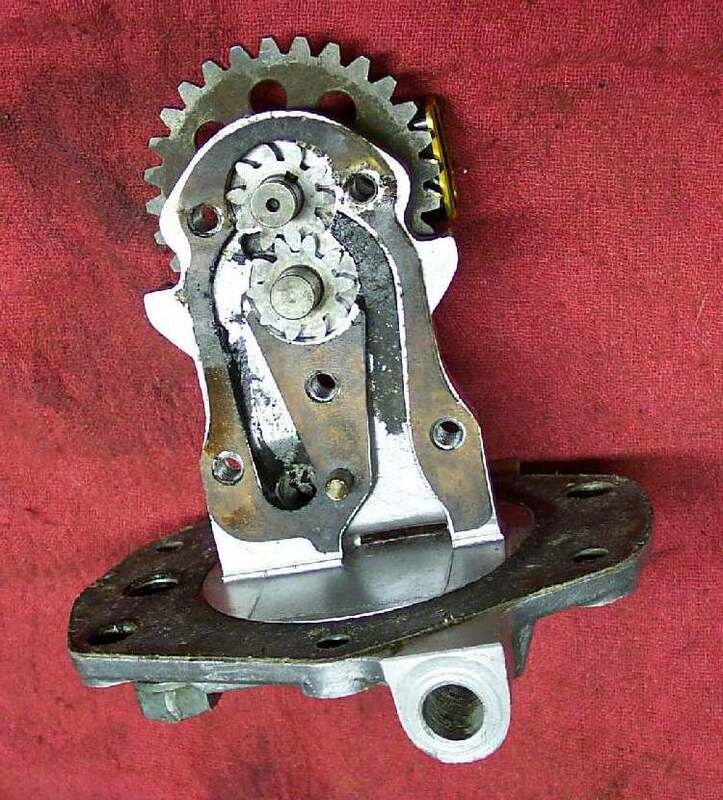 Now Harley did have a "Vane" type oilpump, but it gave way to the gear type back in the 1950s or so. A bit before my time. 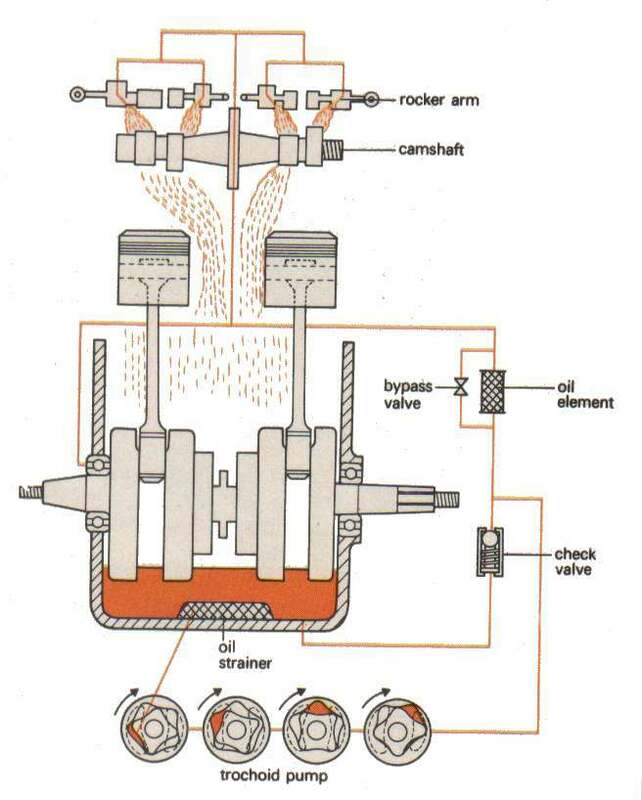 Gear Oil Pumps Closely meshed gears, in a housing pump the oil. Used on early Hondas, BSAs, Harley Davidsons, and others. Piston Oil Pumps A piston in a small cylinder with one way valves pumps the oil. used on Honda 160/350 twins, Triumphs, and others. 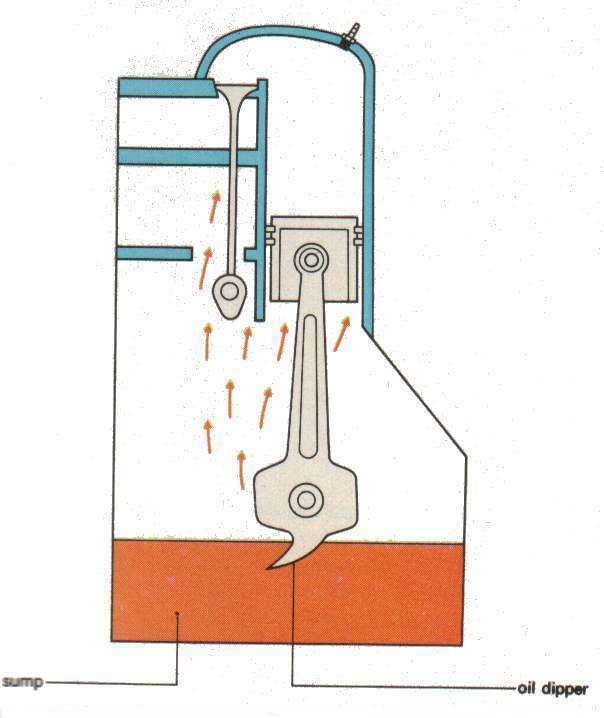 Trochoidal Oil Pumps A star shaped gear with rounded points, rotating in a special housing pumps the oil. Used on most all modern motorcycles. 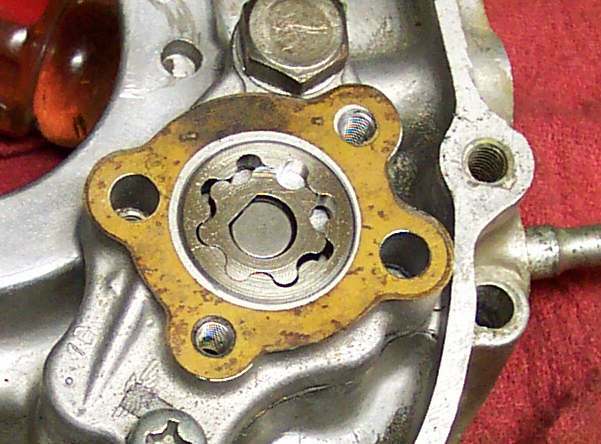 Harley Davidson calls these "Gerotor" oil pumps. 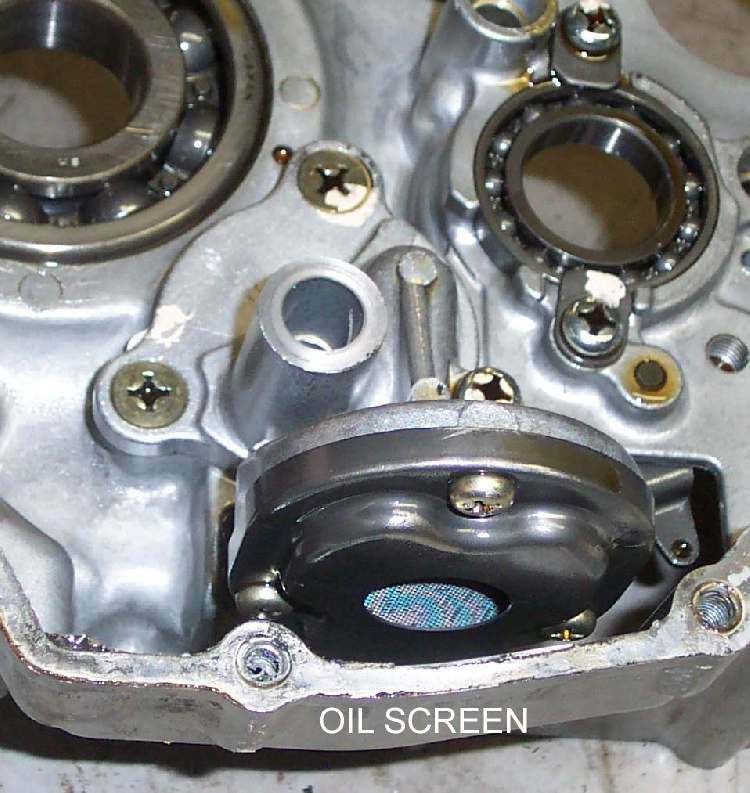 Centrifugal Oil Pumps Grooves cut in the camshaft bearing surface force oil up to the valves. Used on 50/70cc pushrod Hondas. Gear, Piston, and Centrifugal have been fazed out for the most part. 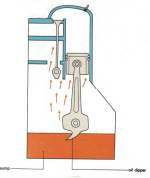 Most all current oil pumps are of the Trochoidal type. It seems to be the most efficient and most popular. 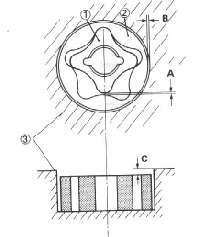 Trochoidal pumps can be measured for wear with a feeler gauge. 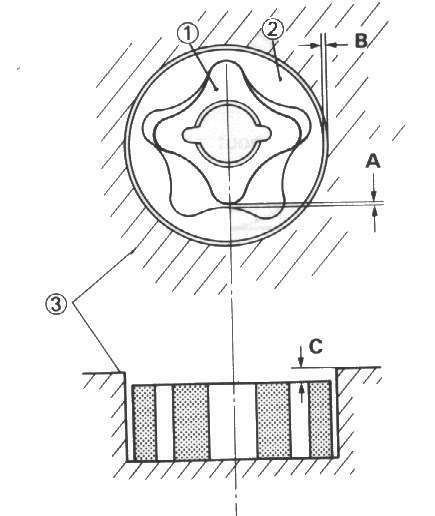 "A" The clearance between the inner rotor (1) and the outer rotor (2). Should be around .002" to .006"
"B" The clearance between the outer rotor (2) and Oil Pump Housing (3). Should be around.003" to 006"
"C" The clearance between the face of the inner (1) and outer rotors (2) and the Oil Pump Cover (3). Should be around .001" to .009"
These are VERY general specs. 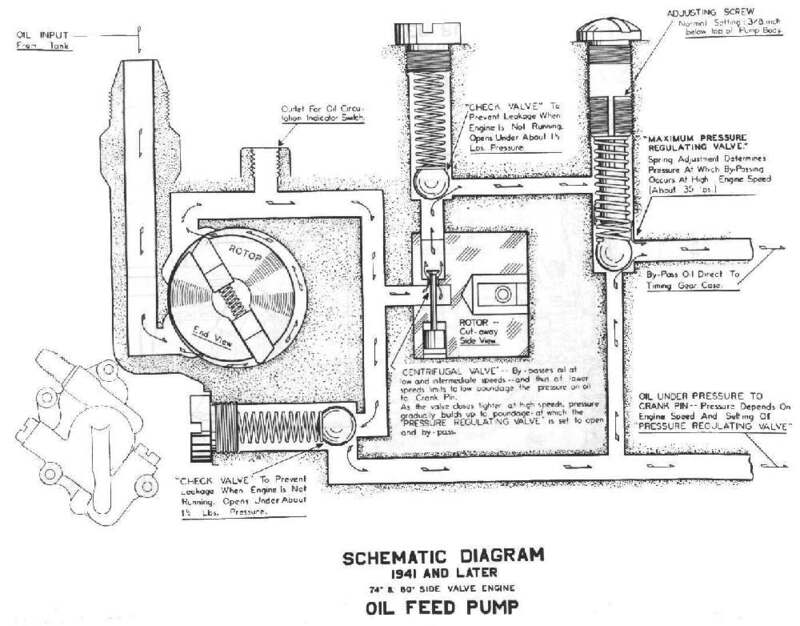 The specs for each make of Trochoidal oilpump vary quite a bit so check your shop manual. 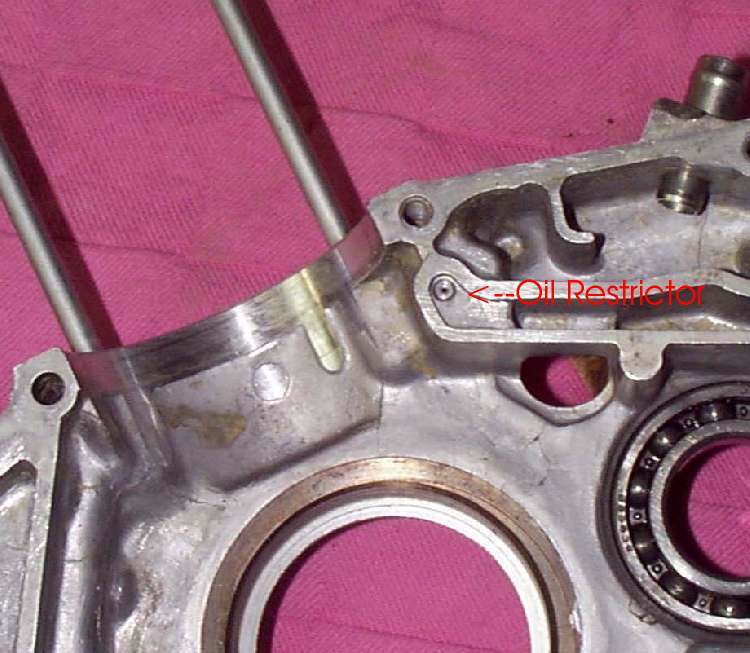 Honda Gold Wings are wet sump but use two oil pumps. The main engine pump and an extra pump to lubricate the clutch. Most of these oil pumps can be removed with the engine in the frame, but you may have to remove the clutch basket to get at them. 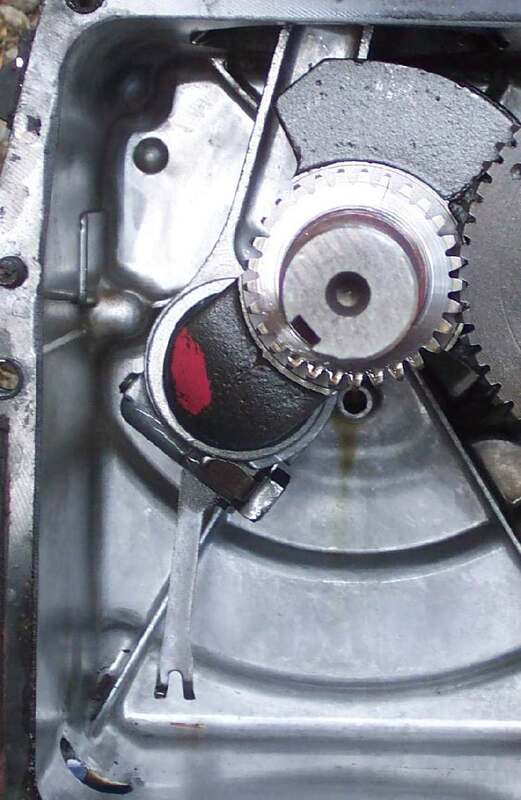 Some, like the DR350 Suzuki single have one pump on the outside of the crankcase and the other inside. It just depends on how dumb the designers where. 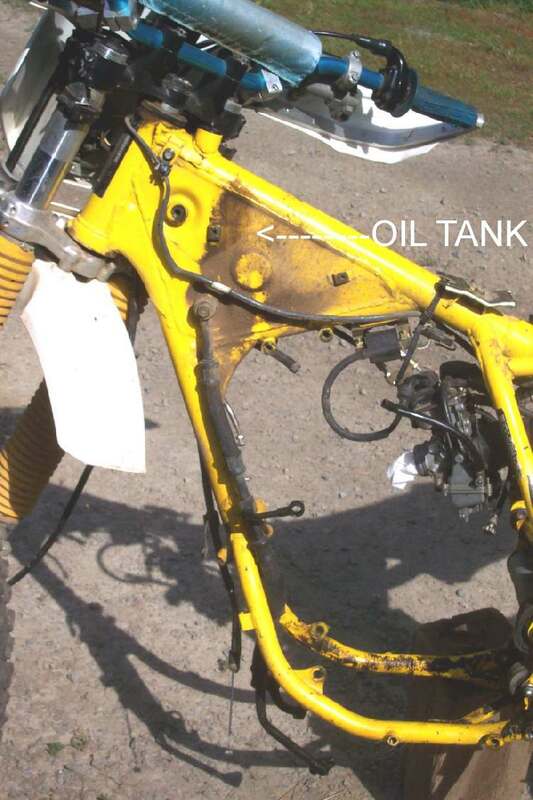 Oil pumps are normally very reliable, but if the engine has blown up, it's a good idea to check their screens and pump clearances in case debris has gotten into them. If the engine is a dry sump, check and clean the oil tank too. 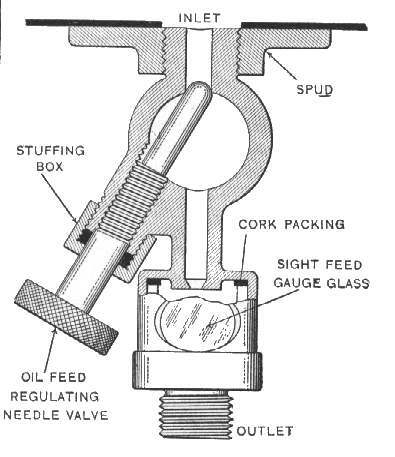 Often, there will be restrictors in the oil passages. This is to control the oil pressure, in the engine, before or after the restrictor. Make sure you check these restrictors for gook, bits of metal, or anything that would plug them up. 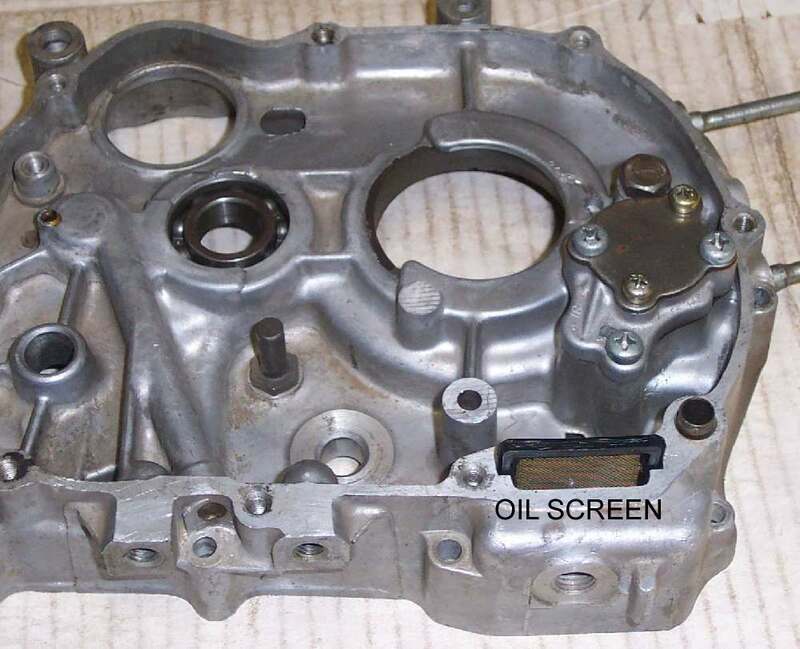 Also check and see where the Oil Pump Screen is. Lots of times, these screens can only be checked and cleaned with the crankcases split or the clutch cover off. Don't find out the screen is plugged after you put everything together. Sometimes there will be an external oil line to the head, and they will brag about how easy it is to clean. Then they put the oil route up one of the cylinder studs and brag that it can't be damaged by a rock or some such thing. Seems to me it's six of one, half dozen of another. Just make sure the passages are clear. 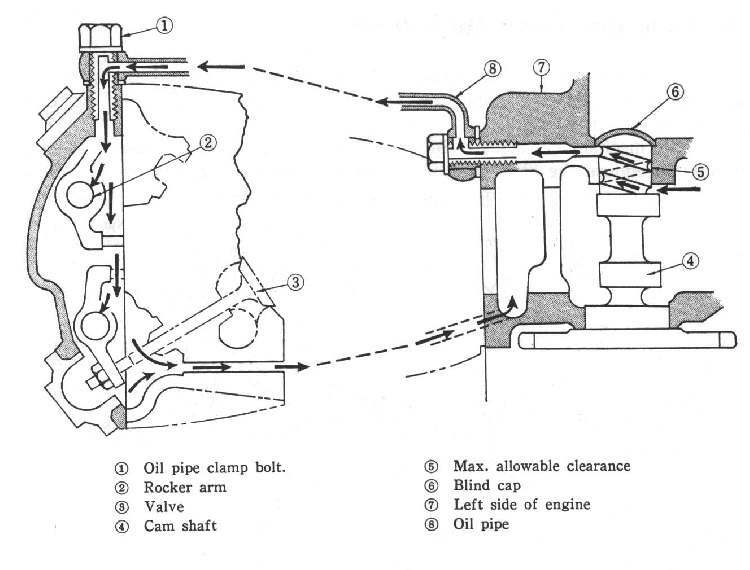 Below are some exploded Oil Pump views for you to study and HERE are a goodly number of Oil Flow Charts, from different engines, for you to study too. Copyright � 1999-2004 dansmc.com. All rights reserved.